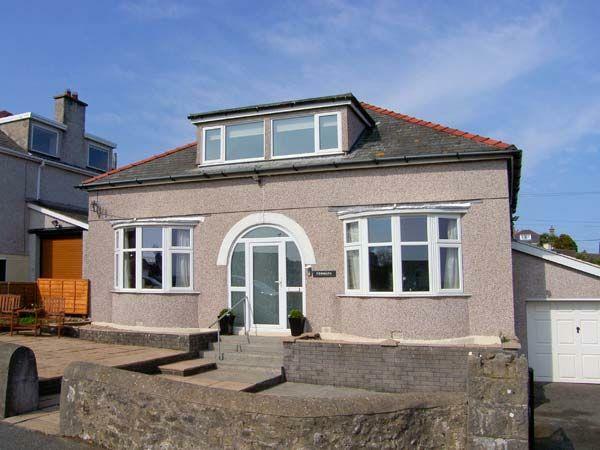 The holiday cottage of "Penmaen" can be found in Benllech near Red Wharf Bay in Gwynedd. This cottage sleeps 10 people, and has 5 bedrooms. The cottage has the following bedrooms: Five bedrooms: 1 x king-size double, 1 x double, 1 x ground floor double, 1 x twin, 1 x ground floor twin. Bathroom with bath, shower over, basin and WC. Ground floor wet room with walk-in shower, basin and WC. First floor basin and WC. Open plan living area with kitchen, dining area and sitting area (seats 8) with electric fire. External games room. 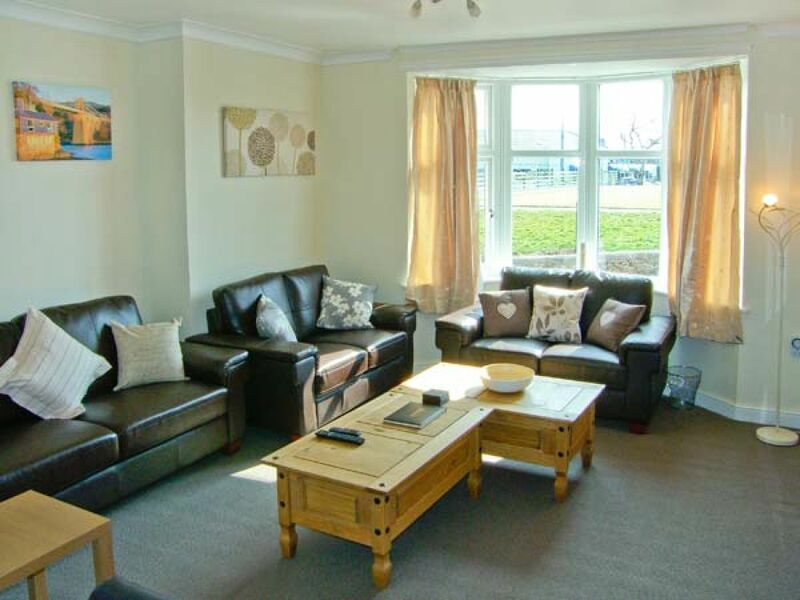 Penmaen is a good size for friends and family to enjoy. These are the reviews for Penmaen. There are 13 reviews. The generous welcome hamper was a very nice touch. The location in Benllech is very good. Well placed for the beach, supermarket shopping and a good range of food takeaways including a fish and chip shop serving Gluten Free food (this was really good as one member of our family is Coeliac ). The front of the cottage overlooks the bowling green and also has sea views giving a very pleasant outlook. Only a couple of small grumbles. The Games Room’ was rather disappointing - very run run down dusty and neglected. Could definitely do with a makeover. Parking - it was a really tight squeeze to negotiate the car through the narrow gateway and certainly wouldn’t fancy doing it in the dark. That said, we had a really lovely holiday that everyone enjoyed. The views from the cottage were beautiful and facilities in the town were good. We had lots of lovely meals at various pubs and hotels, all with walking distance. The house was spacious and very well equipped and supported 3 generations and a dog - from small baby to grandparents - to come together but not be on top of each other. The location was brilliant - a short walk to a wonderful beach with various eateries on hand. Definitely recommend the bacon sandwiches at Bradleys for breakfast ! It was also only a 40 minute drive to the furthest points of the island to discover lots of other impressive and secluded beaches. Also have to mention the wonderful welcome pack - really generous and helpful. We felt immediately at home here. The Owners left us a very generous and most appreciated welcoming pack, and were there to greet us when we arrived. They could not have been more helpful. I would thoroughly recommend this Holiday Cottage - very good for access to lots of lovely places to visit and brilliant places to eat. It is clean and well furnished with the the kitchen having more than adequate equipment to cook for, and serve ten people. There is ample space in all the other areas which were well furnished, cosy and warm. The owners had put up a Christmas tree and decorations around the house which all added to making our stay a very pleasant one. The 'welcome hamper' in the kitchen was a lovely idea, and also very welcome - thank you for including all those useful items. The directions to the property were accurate, and we enjoyed the short walk to the beach. Having the shops close by also makes the location of the property very appealing. Would certainly rebook! We found its location meant we didn't need to use the car and Benllech beach makes for the perfect bucket and spade holiday,]. Our grandsons, aged 4 and 18 months loved it! Well equipped and thoughtful owner who responded to requests very promptly but inobstrusively. When I booked I presumed that with the number of bedrooms in a small looking bungalow, that we would be like sardines, but very much not so. All the accommodation was very spacious. Greeted by a very well thought out hamper, that saved us from an immediate dash to the shops. Should you plan to make a three course meal for ten occupants, then the cooking facilities would let you down, but like most we only used the kitchen for breakfasts and snacks. All round a very nice accommodation that we will happily recommend. If you're looking for other cottages around Penmaen, we've got some cottages below which may take your liking. There are 106 cottages within 5 miles of Penmaen - and they have reviews too.